The Charleston Bump lies at the north end of the Blake Plateau. Click image for larger view. This fish, originally thought to be a pink deepsea anglerfish (Chaunax pictus), tries to scare off the Johnson Sea-Link by raising itself on its pelvic fins. Also seen in the photo are white deepsea branching corals. The fish has subsequently been identified as a red eye gaper. Click image for larger view. Off the east coast of North America, the edge of the continent extends seaward beyond the beach and out onto a gentle slope that forms the sea floor of the continental shelf. This shelf slopes seaward to the continental slope, where the bottom begins a relatively steep drop down to the continental rise and beyond to the "abyss," where it plunges to a depth of a mile and a half. Off the coast of South Carolina and Georgia, the continental slope is interrupted by a relatively flat area called the Blake Plateau. This plateau divides the continental slope into the Florida Hatteras slope (inshore) and the Blake Escarpment on its offshore side. Sitting at the northern end of this flat plateau is the Charleston Bump. The Bump rises off the Blake Plateau from depths of about 2,200 ft and extends upward toward the surface. 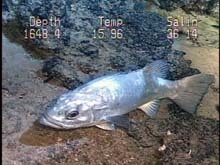 Although the rise stops some 1,200 ft below the sea surface, the Bump plays the role of an "island" habitat for species such as wreckfish (Polyprion americanus), which prefer deep reefs, but not those as deep as the plateau itself. Because the Charleston Bump is an island of shallower habitat on this deep plateau, it is a haven for wreckfish, barrelfish, blackbelly rosefish, swordfish, sailfish, and marlin. Bottom fishes like wreckfish are attracted to the steep, rocky bottom, which provides food and shelter. Pelagic fishes like swordfish are attracted to bottom features such as canyons and seamounts, and the Charleston Bump is a known hot spot for catching these highly desired species. What is the attraction for the fish? Scientists aboard the Seward Johnson II are investigating the Charleston Bump with a variety of methods to answer this question. This ilustration of the Charleston Bump shows the conveyor-belt-like food chain, with midwater fish and squid being important prey for red sea bream at the top of the Bump, as well as for the wreckfish that abound on steep scarp faces and overhangs. Click image for larger view. In the open sea, food production takes place in the upper, sunlit surface layers. 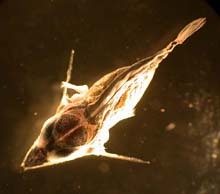 Tiny marine plants, the phytoplankton, thrive in the sunlit regions, and provide food for the small animals, known as zooplankton, that graze on them. Fishes in the water column migrate upward at night under the cover of darkness (thus avoiding predators) to feed on the zooplankton near the surface. During the day, these midwater (or mesopelagic) fishes once again avoid predators by returning to deep (1,000-1,600 ft), dark, cooler waters, where their evening meal is digested more slowly. On the Blake Plateau, the Charleston Bump rises up and reaches into the layers where these well-fed fish, squid, and shrimp rest during the day. Deep-living wreckfish lurk in caves and under overhangs on the Bump, and come out to feed while the vertically migrating fish and squid are traversing their daytime depths. During our submersible dives, we counted numerous lanternfish, squid, shrimp, and other vertically migrating animals near the bottom. They were especially concentrated near the bottom at mid-day, where they were available as prey to large predators such as wreckfish. The Gulf Stream provides a continuous stream of these prey organisms flowing over the Bump, not unlike a conveyor belt. This dynamic food chain makes the Charleston Bump a very productive fishing bank. Wreckfish weigh about 35 lbs and are associated with rocky bottoms. Click image for larger view. The Charleston Bump is an important commercial fishing ground. It holds the only known North American population of wreckfish, a species that is also commercially fished in the eastern Atlantic, the Mediterranean, Brazil, and the western South Pacific. The Charleston Bump is also an important fishing ground for swordfish. Wreckfish live on the bottom, and prefer the Bump's deep, rocky habitats. The wreckfish fishery on the Charleston Bump is highly regulated, and is a fishery management success story. Relatively new, its successful management is due in large part to the fishermen who discovered the species off the coast of South Carolina and Georgia, and who then developed the method to catch them. The fishery began in 1987 and rapidly expanded as additional fishermen considered wreckfish as a new commercial opportunity. The fishermen who developed the fishery, fishery biologists who began to study the new fishery, and fishery management agencies charged with maintaining sustained fisheries became concerned that the resource could not support unlimited expansion. Initial fishery data indicated that wreckfish habitat was fairly limited, that wreckfish are long-lived and slow growing, and that we knew very little about wreckfish spawning and the source of wreckfish that were being recruited to the Charleston Bump. The South Atlantic Fishery Management Council (SAFMC), which manages reef fish in the U.S. Southeast, implemented a fishery management plan that included a total allowable catch, a closure of the fishery during spawning season, the banning of certain fishing gear (bottom longlines), and an individual transferable quota (ITQ). Under the ITQ system, each wreckfish fisherman owns a share of the quota, and can choose to fish it anytime during the open season. This prevented an opening day rush to bring the fish to market, and assured fishermen of a stable, reasonable price. The presence of young larvae indicate that Charleston Bump is a spawning ground for sailfish. Click image for larger view. With a management plan in place by 1990, the fishery was closed when the total allowable catch was exceeded only once. Many marginal fishermen who were not eligible for large shares dropped out of the fishery. The spawning season closure prevented fishing of spawning aggregations that occur on the Charleston Bump, and annual assessments have indicated an increase in the wreckfish population and catch per unit of fishing effort in recent years. Fishery management for wreckfish has allowed some fishermen to catch and sell the fish to the fish-consuming public, while maintaining a sustained population -- a win-win situation. One reason this plan has been so successful is because the fishers themselves support it. Swordfish are also abundant on the Charleston Bump, and the swordfish longline fishery is active there. Unlike wreckfish, swordfish live in midwater or at the surface, and are not sedentary bottom dwellers. They are highly migratory, and move freely among the waters of several nations. Satellite tagging of swordfish indicates that individuals inhabiting the Charleston Bump in early spring may be found halfway across the Atlantic by late summer. This life history makes the fish difficult to manage, because so many jurisdictions are involved. Swordfish are managed by an international body, with quotas applied to each fishing nation. Although in an overfished state, swordfish populations have increased in recent years. In addition to concern for overfishing of swordfish on the Charleston Bump, concern also exists regarding the bycatch of undersized swordfish and the bycatch of nontargeted species, such marlin and sailfish. In an effort to reduce the catch of undersized swordfish and nontargeted species, the National Marine Fisheries Service has closed the Charleston Bump area to pelagic longlining from February through April. Additional study should show if this management method is effective. Additionally, the SAFMC Snapper/Grouper Committee is considering Marine Protected Areas (MPA) as a fishery management tool to restore reduced stocks of snapper and grouper. The wreckfish is managed under the Snapper/Grouper plan, and consideration has been given to designation of a portion of the Charleston Bump as an MPA. The Bump contains unique habitats and large populations of wreckfish found nowhere else in the United States. Because of the uniqueness of the habitat, it may be considered for special management designation, as have other habitats with limited distribution in U.S. waters, including coral reefs. The wreckfish is currently well-managed, however, and MPA designation may not be needed to sustain the fishery. This Cuban dogfish was spotted on the Bump during the Sept. 27 morning dive. Click image for larger view. 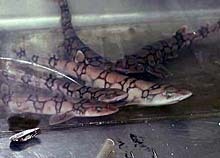 The chain dogfish is a common inhabitant of the Charleston Bump. Its striking coloration helps it blend into its environment. Click image for larger view. The shark species living in and around deep-water habitats such as the Charleston Bump dwell in an environment quite different from that of the shallow-water coastal sharks that people most often encounter. The dark depths in which these sharks reside have little or no sun-driven photosynthesis, which supports the majority of Earth's ecosystems. As a result, food is often scarce in these deep-water environments, and the sharks must be highly adapted in order to survive. Though they resemble their shallow-water relatives in many ways, they also exhibit some striking differences. Many species ascend to shallow waters at night in search of prey, and return to the darkened safety of deeper waters during the day. Deep-water sharks also have large eyes to gather as much light as possible in their dim world. Certain species even contain their own light-emitting organs (photophores), which they use to attract small prey into striking distance, or as camouflage to disguise the outline of their bodies from potential predators. The most common deep-water sharks encountered on the Charleston Bump are from a group known as the dogfish, of which four species (spiny dogfish, roughskin spiny dogfish, Blainville's dogfish, and Cuban dogfish) are most prevalent. These species are characterized by a small maximum size (3 ft o r less), a "sharklike" body, grey to brown skin color, and spines protruding along the front of each of their two dorsal fins. These sharks prey on a variety of species, including small fish, squid, shrimp, and other invertebrates. 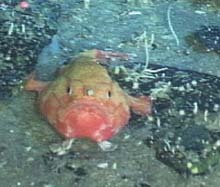 The chain dogfish is another common inhabitant of this environment (its common name is a misnomer, however; it actually belongs to a group called the "cat sharks"). This bottom-dwelling species is easily recognized by its striking coloration, with distinctive black or brown lines that form a "chainlike" pattern across the entire body. This coloration helps the chain dogfish blend in with its bottom habitat. Though the diet of this species is relatively unknown, it has been captured on fishing gear baited with squid. The small adult size of this species (a maximum of under 2 ft) has led to its limited popularity in private and public aquaria. 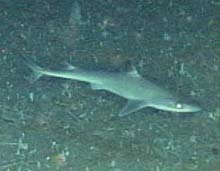 Deepwater sharks, as a general rule, are small in size. It is theorized that body size in this environment is limited, at least in part, by food scarcity. A smaller animal can survive on less food than a larger one. Nevertheless, some deep-water sharks ignore this "rule." Most notable of these are the cowsharks, at least three species of which (sixgill shark, bigeye sixgill, sharpnose sevengill shark) are known to inhabit this area. The sixgill shark is the largest of the three, and may reach up to 16 ft in length, while the bigeye sixgill and sharpnose sevengill reach about 5 to 6 ft. These species are easily identified by the presence of 6 or 7 gill slits, as the vast majority of shark species have only five gill slits. Though relatively little is known about the habits of cowsharks, there is evidence that they visit surface waters at night, and dwell near the bottom during the day. Cowsharks feed on a wide variety of prey, including fish, crustaceans, squid, and other invertebrates. The enormous pressure exerted by seawater at the depths in which these sharks live make them difficult to observe in their natural environment. Most of what is known about deep-water sharks has been gathered from specimens examined at the surface after incidental capture by deep-water net trawls or other types of fishing gear. Though much has been learned about these creatures by studying them at the surface, their life cycles will remain mysterious until further studies are accomplished. The use of deep-sea submersibles, such as the Johnson Sea-Link, provides scientists with rare opportunities to learn more about these relatively little known and fascinating creatures.